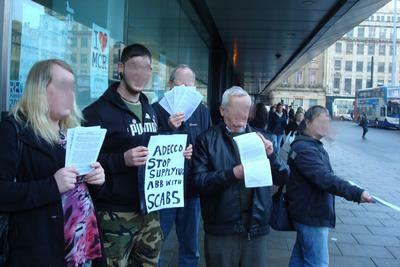 The Manchester SF local organised a picket of the Adecco office in the centre of Manchester on 6/3/12. Management seemed prepared for the picket and issued a statement arguing they had no say as to what happened in Spain. We distributed several hundred leaflets and a number of people took leaflets to pin up in their workplaces.